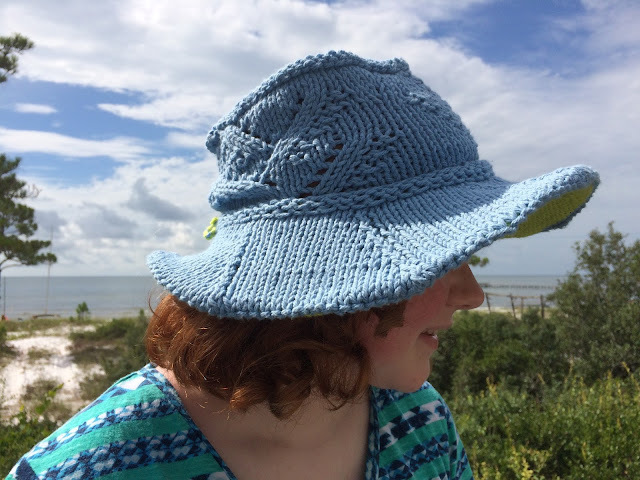 I made up a new hat the summer of 2016. 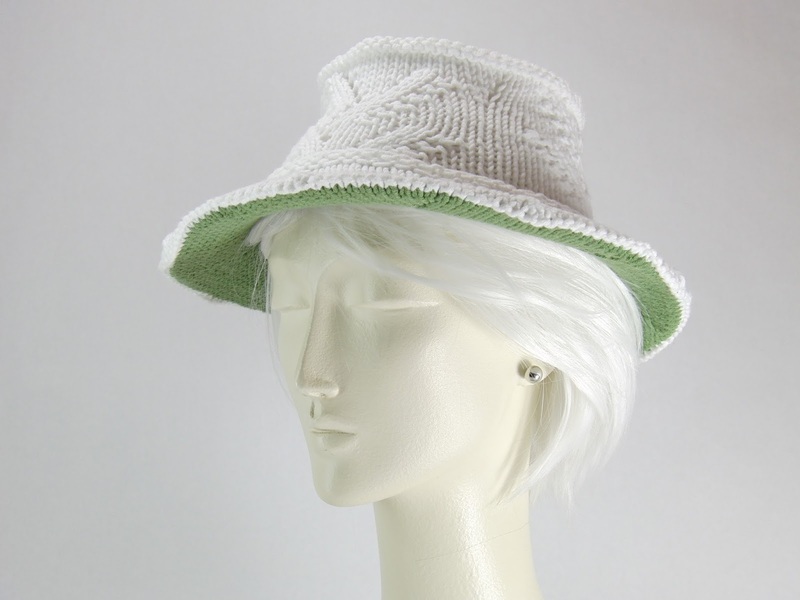 I wanted a shape like a Panama hat with open work on the sides to make it summery. This is what I came up with. I worked on this pattern as a spreadsheet in Numbers. I converted the whole thing to a PDF and uploaded it to Ravelry where you can buy now for $5. If that link doesn't work try going to the pattern on Ravelry directly. This is the first pattern I've published. I recognize that I'm violating the scientific method by trying every new idea I have all at once instead of testing them one at a time against a control. I tested this hat in two kinds of yarn, Lily Sugar'n Cream, which comes in all kinds of colors, and Baby Bee Hushabye, which comes in Angel, Naked, Baby Sage and not a lot else. (I bought up all the Apricot Jam they had when it was discontinued and I'm making a really cute dumbo octopus out of it.) Both of these are machine washable yarns. I have not yet washed one of these hats in the machine with the nylon cable in place. I weigh my yarn before and after projects with a 3 decimal place electronic scale that is good for up to 500 g. I put this information in the pattern in case you have some partial balls of yarn left and you want to know if it's enough. A partial skein of Lily Sugar'n Cream will do the bottom of the brim but you need MORE THAN A FULL SKEIN for the main color of the hat. (If you have the regular 70g skeins of this yarn.) If you are buying yarn for a two color hat you need to get 3 skeins, 1 skein of contrast color and 2 of main color. 2 skeins is enough if you do it all one color. In the Hushabye 50/50 cotton/acrylic blend you need one skein of each color. You could do the child size and adult small with one skein all one color. The size large requires almost a whole skein for just the main color so it would not be enough for a one color hat. I tested the child size with the contrast color of the brim in a different yarn, a black microfiber. This did NOT work well. The top and bottom of the brim really have to be the same kind of yarn or it just doesn't come out exactly even. I also did the lace part of that one with US 10 needles and it just looked sloppy. That's why I went down to US 9 on the white and green hat. The brim of this hat is held out with nylon weed trimmer line. You can buy a wide variety of colors and sizes at Home Depot and in the Garden Center at Walmart. 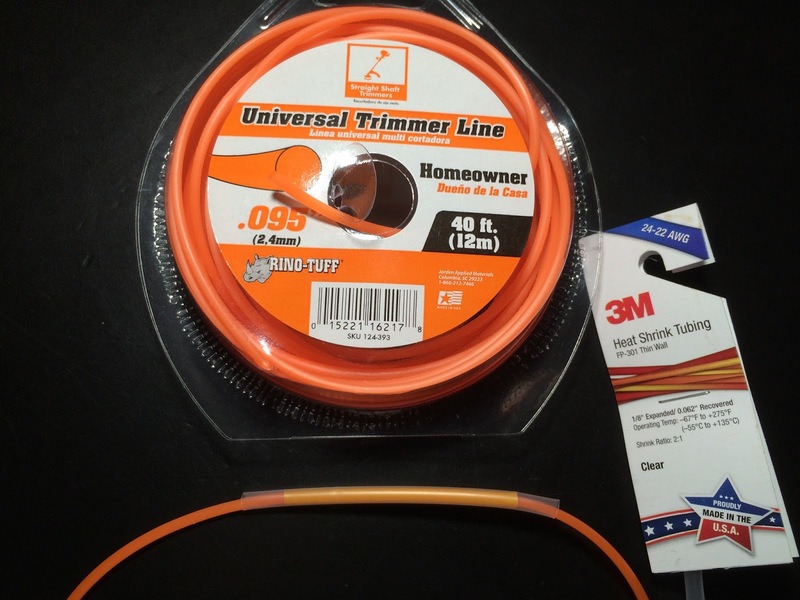 The orange color from Walmart has a strange dusty quality I don't like so I have been using the smoother .095" line from Home Depot. I have yet to find a white version. It's all outrageous colors. It doesn't show through the hat though. If you know somebody with a weed trimmer ask them to give you about two arm lengths of whatever they've got and you'll have more than enough. The size large hat brim is so heavy the nylon line drooped. I redid that one with a stainless steel cable leftover from a curtain installation. It's the IKEA Dignitet curtain wire and it is outstanding. They give you a lot extra. You could hang your curtains and make several hats with the leftover wire. I've used aluminum floral wire in hats and that works too. But you have to be careful not to bend it out of shape. This springy stuff is a lot more forgiving. For the drawstring in the hat I used a shoelace in the white hat. I couldn't match the color of the other ones with a shoelace so I braided some of the yarn to make a drawstring. My dad gave me a bag full of cord locks because he bought a bunch of them from China for some project. I looked on Amazon and found a lot of different kinds. But if you want just one email me and I'll send you one in the mail. 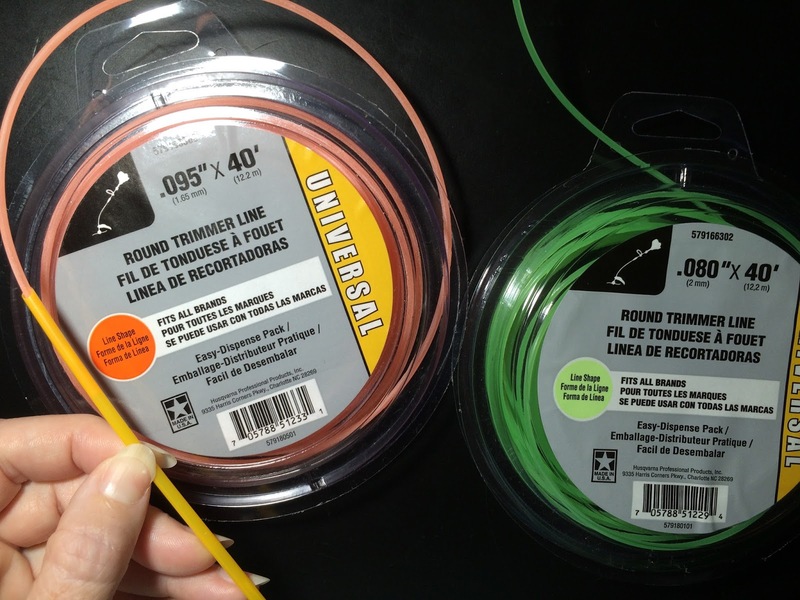 I can throw in some nylon line too if you need it. I got my clear heat shrink tubing from Parts Express. I did the white hat with the ends of the cable butted together inside a stirring straw and then heat shrink over it. Since I finished my last hat I discovered Capri Sun straws at the family beach week. Capri Sun straws fit snuggly over .095"line (which is marked 1.65mm but that's a mistake. 0.095" is 2.413 mm) round trimmer line. The .080" (2mm) is small enough to double it over itself in the 1/8" heat shrink. I wonder if the heavier line, a Capri Sun straw cut down to 2", and 1/8" heat shrink over that would be even better than the overlapped green line I used in the 100% cotton hat in blue and green. Here are some video links with time stamps for critical parts of the pattern. I can imagine a scenario where somebody prints out the pages for the size they are working or maybe their computer won't open the links from the PDF. I tested that my ipad will open the YouTube links in the PDF from iBooks on my iPad but I confess I only test print the first 3 pages of this. I'm seriously anti-paper. Starts with washing and blocking and goes into reinforcing line and drawstring. Didn't break out time stamps as this is all sort of making it up as you go along. This lace pattern I used is based on the Lily of the Valley video by Pleasant Seas. I modified it for exactly two vertical repeats so there aren’t any unconnected branches at the top and bottom. Refer to the original if you would like a repeating version of that neat lace pattern.